Featuring the World’s most comprehensive range of instrumentation needle valves. The Waverly brownall needle valve range is designed and manufactured to the highest standards to meet the requirements of the severe applications anticipated for these valves. They have a split stem design, which ensures accurate seating, and a bubble tight seal. 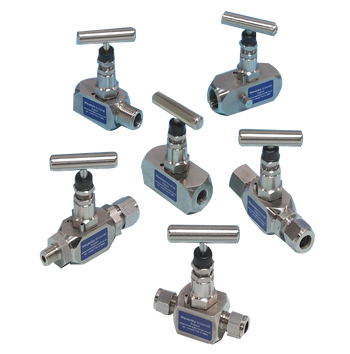 They are general-purpose valves for use on liquid or gas applications where the isolation of flow, equalisation and venting of pressure are the main criteria. 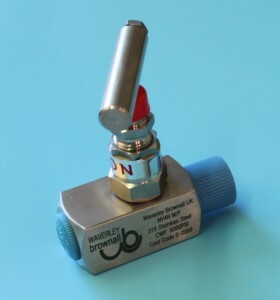 The Waverly brownall needle valve is available ex stock with a variety of end connections from 1/4″ to 3/4″, giving any combination of ends from NPT, BSPP, BSPT, Single and Twin ferrule OD compression. They are available for application up to 10,000 psi and temperatures up to 400 degrees centigrade. Provides bubble tight shut off. Metal to metal bonnet seal. Prevents spindle blow or accidental removal whilst in operation. 8 micro inch finish reduces operating torque. Provides a wide range of valves for many applications. Providing for higher temperature applications. Up to 10,000 psi or 400°C. Valves can be manufactured to NACE. Valves can also be supplied with a panel mount facility. 316 stainless steel as standard. To prevent unauthorised operation of the Valve. ·T· Bar handle made from 304 or 316 stainless steel. Fastened to the spindle by a dowel type 304 or 316 stainless steel locking screw. Colour coded dust capprotects the stem Threads. 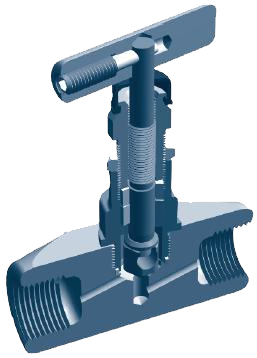 Close tolerance gland pusher allows packing adjustment whilst in service. Gland lock-nut ensures the gland nut is positively located. Close tolerate gland yoke precision machined from 316 stainless steel. Gland packing is PTFE as standard for temperatures up to 200°C. Graphite seals are standard for temperatures up to 400°C. Seating and bubble tight seal. Locking pin made from 304 stainless steel ensures that the correct assembly torque of the valve head is maintained against the effects of vibration and/or temperature. Bonnet precision machined from stainless steel, housing the gland packing below the actuating threads. Bonnet-rotating trim made form 316 Stainless steel, precision machined with Spherical end to ensure a bubble tight seal.